It seems like everyone has a cause to tout these days, from health care reform to gay marriage to…ahem…making fashion more sustainable. Instead of feverishly emailing your friends, tweeting, and updating the “Causes” tab on your Facebook profile, why not get your clothing to do the talking for you? 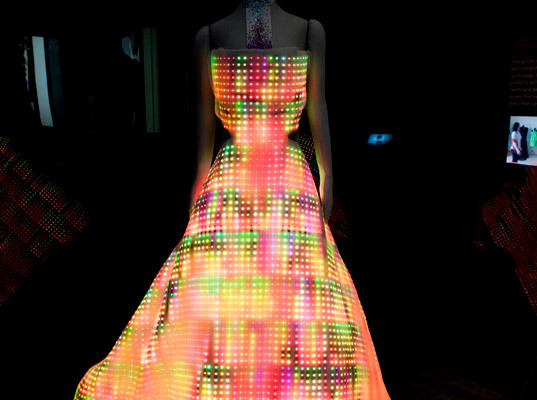 CuteCircuit’s mesmerizing Galaxy Dress lets you advertise your message all over your body with the help of 24,000 full-color LEDs, making it pretty difficult to ignore what you have to say! Click below the fold for a haunting video demonstration. 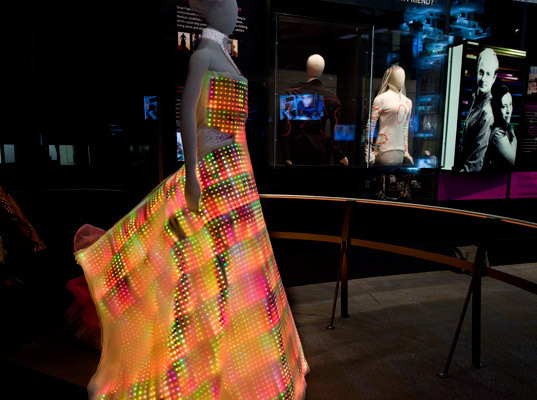 Each of the flat, extra-thin LEDs that illuminate the dress measures a mere 2×2 millimeters, but they work together to create a dazzling light show of hundreds of colors that pulse across the flowing skirt. And we’ve come a long way from those lame, scrolling LED belt buckles—the intricate circuitry that underlies this futuristic frock was painstakingly hand-embroidered on a layer of silk, imbuing it with the fluidity of fabric. 24,000 LEDs work together to create a dazzling light show of hundreds of cascading colors. To diffuse the light and create an even more ethereal effect, the designers added four layers of silk chiffon, along with 4,000 hand-applied Swarovski crystals that extend the gown’s glittery sheen even after the LED bulbs go dim. And although the Galaxy Dress is lightweight, the heaviest part isn’t the technology but rather the 40-layer pleated silk organza crinoline that gives the skirt its flounce. 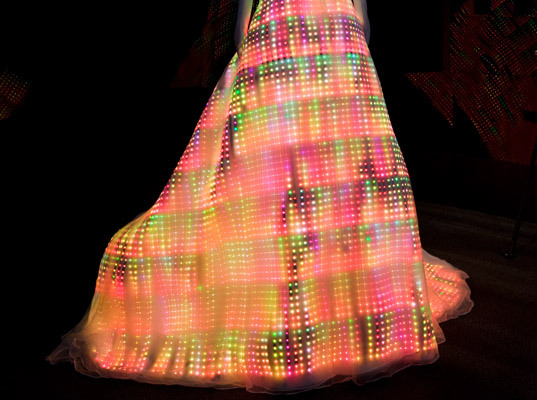 The Galaxy Dress requires only a few iPod batteries for 30 minutes to an hour. On permanent display at the Museum of Science and Industry in Chicago, the Galaxy Dress is still in its prototypical stages, but if it does take off, it could very well be the next big thing in visual communication. If the guys from Daft Punk ever marry someone their bride should wear this dress.